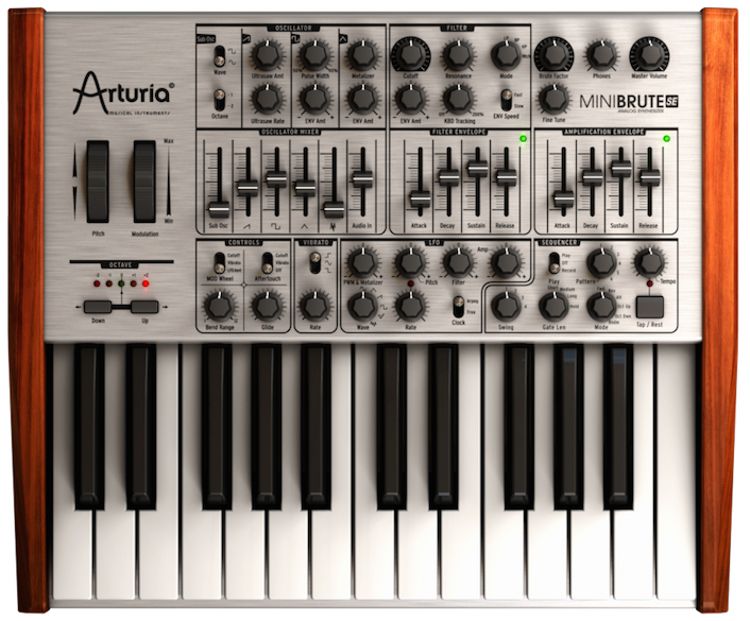 Arturia is proud to launch MiniBrute SE — a ‘special edition’ of its amazing analogue monosynth par excellence — at Musikmesse 2014, March 12-15 in Frankfurt, Germany. Designed for the analogue purist with a creative spirit in mind, MiniBrute SE successfully squeezes an amazing amount of creative options into its eye-catching, exceptionally portable design. The truly hands-on artistic appeal of subtractive synthesis and supreme step sequencing are alive and kicking here — harder than ever! Indeed, it’s all about analogue goodness — all gain and no pain! So stand out from the analogue crowd and make that silver dream a reality real quick with MiniBrute SE. No need for a reality check! Der MiniBrute SE wird ab Ende Mai erhältlich sein. Der Preis soll bei 549,- Euro liegen. Arturia is proud to launch KeyLab 88 — its top-of-the-range 88-note MIDI keyboard controller and hybrid synthesizer solution — at Musikmesse 2014, March 12-15 in Frankfurt, Germany. As implied by name, KeyLab 88 takes its rightful place at the top of Arturia’s acclaimed range of professional-grade MIDI keyboard controllers with a high-quality hammer-action Fatar keybed boasting 88 keys. Indeed, it’s all in the name. For KeyLab 88 comes complete with Analog Lab — Arturia’s accomplished software synthesizer solution for Mac and PC with over 5,000 TAE® (True Analog Emulation) synthesis-powered professionally-programmed presets — to create a performance powerhouse par excellence. Taking its rightful place at the centre of any studio or stage setup where performance is paramount, KeyLab 88’s removable laptop/lead synth stand features a rubber base to prevent slippage during performances — perfect for a spot of speedy soloing on Arturia’s award-winning MiniBrute Analog Synthesizer, maybe? More often than not, precarious placement of laptops is a tricky problem faced by today’s computer-based keyboard performers — not so with KeyLab 88’s aforesaid stand. Screw it on and bring it on! Similarly, its integrated music stand can also accommodate an iPad, so why not also bring along Arturia’s innovative iMini or iSEM iPad soft synths for the musical ride? Neither standalone synth nor iPad are absolutely necessary, of course. Complementing KeyLab 88’s performance- orientated keyboard is a feature-packed panel positively bristling with controls. A supportive selection of knobs and sliders, 16 backlit pressure-sensitive pads, plus an informative LED screen all add up to enriching the performance experience and aiding speedy software navigation. Needless to say, KeyLab 88 definitely delivers on its promise to provide the immediacy of a hardware synthesizer with the flexibility of a software-based solution since it is entirely preassigned to work with Analog Lab from the get-go. Fashion filter cutoff, reduce resonance, adjust ADSR envelopes, and much more besides — but without the inconvenience of having to always reach for a mouse or trackpad. The extremely large library of 5,000-plus presets by internationally-renowned sound designers included in the Analog Lab software included with KeyLab 88 are taken from all of Arturia’s acclaimed TAE® synthesis-powered Mini V, Modular V, CS-80V, ARP2600 V, Jupiter-8V, Prophet V, and Oberheim SEM V soft synths, together with Wurlitzer V (based on the classic ‘Wurly’ electric piano). Play or program. Either way, Analog Lab’s intuitive interface invites users to tweak the presets, although anyone owning full versions of those Analog Classics can cleverly access all sound parameters via the instrument interfaces without leaving Analog Lab. Likewise, 200 adjustable Multi patches are already organised by genre so you don’t have to. These let you play chords with one finger, layer or split synths sounds simultaneously, and apply effects… everything needed to kick-start creativity, whatever your musical preference. 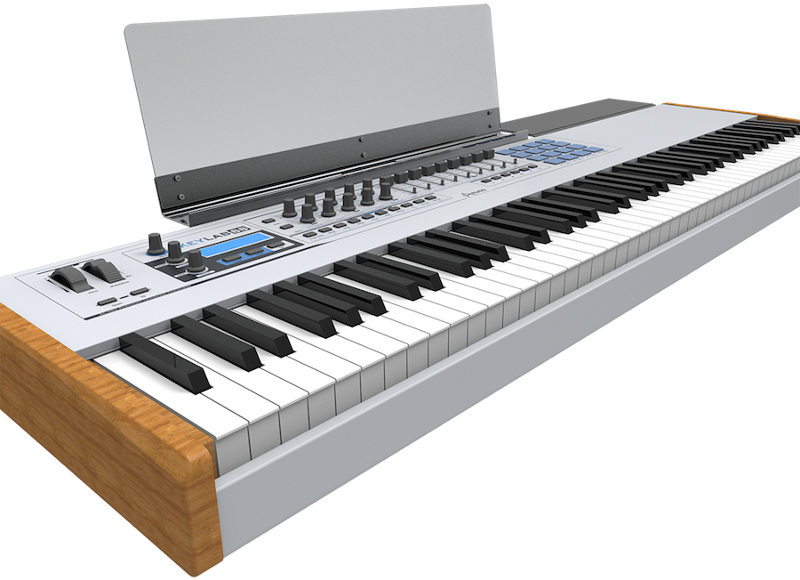 Speaking of which, KeyLab 88 also acts as a highly-capable controller compatible with any third-party software or hardware. Customisable MIDI assignments are always accessible via the LED screen or the included MIDI Control Center software, so anything is possible. Perform the way you want to with the top-of-the-range KeyLab 88, a highly-playable, superb-sounding software/ hardware hybrid synthesis combo. One thing’s for sure… you won’t run out of keys! Der Preis steht derzeit noch nicht fest. Lieferbar soll das Keyboard ab Ende August sein. Arturia is proud to unveil VOX Continental-V — bringing back the coveted classic sounds of the Sixties-vintage Vox Continental 300 organ as an authentic software emulation for Mac and PC — at Musikmesse 2014, March 12-15 in Frankfurt, Germany. 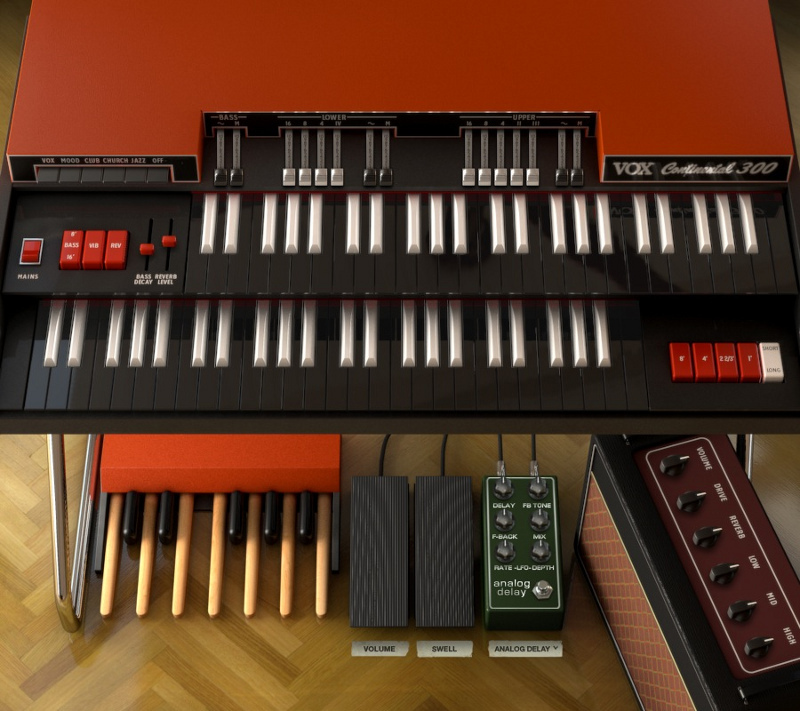 As a high-end software recreation of the Sixties-vintage Vox Continental 300 transistor-based combo organ, VOX Continental-V is the latest addition to Arturia’s acclaimed Analog Classics lineup where it sits alongside an authentic recreation of another archetypal Sixties staple, Wurlitzer-V (based on the classic ‘Wurly’ electric piano). Introduced in 1962, the Vox Continental — or ‘Connie’ as affectionately it became known — was originally designed to address the needs of touring musicians, but became musically much-loved in its own right. As such, it prominently featured on many hit records of the time, including The Animals’ classic ‘House Of The Rising Sun’ in 1964 and, a little later, ‘Light My Fire’ by The Doors. Onstage, The Beatles performed a memorably frenzied version of ‘Help!’ B-side ‘I’m Down’ during their August 1965 performance at New York’s Shea Stadium with John Lennon playing a Vox Continental using his elbows at times! Despite being phased out of production in the early-Seventies, the Vox Continental has stood the test of time, too, playing a pivotal part in generating many of the distinctive keyboard sounds supporting later musical genres, including almost everything ever recorded by British Ska revivalists Madness, as well as New Wavers like Elvis Costello and The Attractions and American counterparts Tom Petty and The Heartbreakers. However, Vox organs have become increasingly difficult to acquire due to the high prices that they can command, compounded by the limited supply of working units. Today, VOX Continental-V gives contemporary, computer-based musicians instant access to those same hit-making sounds of yesteryear, and much more besides — and all without breaking the bank! Like the transcontinental history of the original Vox Continental, the road to creating VOX Continental-V was a long and winding affair. Arturia started its latest software developmental journey in the company of a rare Vox Continental 300 dual-manual model, capturing every nuance of the original right down to key contact timing and background noises — no elbows needed! Next, Arturia acquired a rare Jennings J70 — developer Tom Jennings’ Vox organ forerunner — and added a J70 Mode to the VOX Continental-V voice engine. End users have effectively ended up with two ultra-rare organs for the price of one as a result — with more tones to play with, which musically is a good thing to have! The end result is surely the most authentic dual-manual Vox Continental 300 emulation that money can buy. Notable VOX Continental-V features include upper manual, lower manual, and bass pedal sections; multiple output effects processors; and independent channels per manual. Moreover, Expanded Mode adds a full compliment of drawbars for each harmonic; a new waveform drawbar on each section; several popular effects; LeslieTM and guitar amp simulator outputs; and an expanded percussion section. Similarly, Services Mode allows for individual tuning of each pitch — just like an original Vox; alterable key contact timing (to simulate older key contacts); and authentic background noise bleed control. VOX Continental-V works as a plug-in with popular DAWs and is also available as AAX, AU, VST, and VST3 standalone versions for Mac (OS X 10.6 or higher) and PC (Windows 7 and 8). Tight integration with Arturia’s acclaimed range of KeyLab professional MIDI keyboard controllers makes for the perfect performance pairing with which to light your musical fire — from those coveted classic sounds of the Sixties and beyond. Die Software wird Ende April zu einem Preis von 119,- Euro direkt bei Arturia verfügbar sein.